Young children are naturally curious about the world around them, and they tend to touch unknown items or stick small objects in their mouths. Items such as coins, balloons, and certain toys are choking risks for inquisitive children. Parents of youngsters must be aware of household items like these and remove such objects from places where kids can easily reach them. Coins in particular may easily and carelessly be left on coffee tables or the floor. These objects accounted for about 18% of all choking-related emergency room visits in 2001 for kids ages 1-4. If your child has suffered a choking injury from a coin that someone else negligently left out, you may be able to obtain compensation for the injuries your child has suffered. Please contact coin-choking injury lawyer Jeffrey Killino today at 877-875-2927 to learn more about your rights and the compensation you may be entitled to. Move all coins to high or secured areas to keep them out of your child’s reach. Provide proper supervision of your child when he or she is playing in rooms also used by adults. Learn CPR so you can provide life support if a choking situation does arise. Teach older siblings and their friends not to give coins or small objects to your young child. Check the floor for coins that may have fallen out of purses or pockets. Do not leave clothing, purses, totes, and other receptacles within a child’s access if they contain coins or other small objects. Taking these simple preventive measures will greatly reduce your child’s risk of choking on coins. When children put coins in their mouths, they run the risk of suffering several types of injuries, many of which may be serious or even fatal. If a coin is swallowed, it may become lodged in the esophagus, resulting in pain, gagging, and drooling. If a coin becomes lodged in the child’s trachea, the child may suffer from complications associated with airway obstruction, including brain damage, breathing failure, or even death. 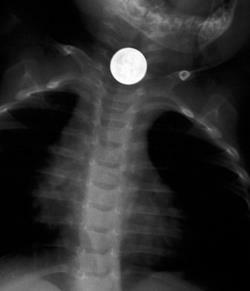 More often than not, a child’s coin-choking injury is altogether accidental. If coins are left within a child’s reach or access through negligence or reckless disregard of another, however, the individual or individuals responsible may be held liable in negligence for damages suffered as a result of a coin-choking injury. Such incidents often occur as a result of negligence on the part of babysitters. It may also result from the negligence of homeowners on whose premises a child is present. Children often spend time in someone else’s home or yard. They may be invited onto the premises or wander onto the property when nothing has been erected to prevent their access. A homeowner’s liability for injuries that occur to others while on the homeowner’s property varies somewhat from state to state. Many states’ laws hinge a homeowner’s liability on the status of the person injured. An invitee is generally someone who enters a homeowner’s premises for a business purpose, such as to do work on a person’s home or land, but may also be someone who has been invited for a social purpose. The homeowner will be held to a duty of care to keep the premises safe for anyone falling into the category of invitee. If a dangerous condition is not readily apparent, the homeowner has a duty to warn the licensee of the danger. A licensee is usually someone who has been invited to or given permission to enter someone’s premises. Homeowners also owe licensees the duty to exercise ordinary care to keep the premises safe while licensees are present as well as to warn them of any hidden dangers. Trespassers are people who have entered another’s premises without either express or implied permission or invitation. Homeowners generally owe no duty at all to trespassers to exercise ordinary care for their safety. On the other hand, homeowners may not create traps for trespassers or willfully cause them harm. Once a homeowner is aware that a trespasser is present on his land or can expect or anticipate the trespasser’s presence, however, a duty to exercise ordinary care for the trespasser’s safety arises. A greater duty of care may exist with respect to child trespassers. If a child’s trespassing is reasonably foreseeable to a homeowner because, for instance, the homeowner’s premises contain an attractive nuisance (something particularly attractive and enticing to children, such as a swimming pool or playground equipment), a duty to exercise reasonable care to keep the premises safe for such a child trespasser arises on the part of the homeowner. If your child was invited onto someone else’s property or enticed or expected to trespass on such property and suffered a coin-choking injury while on the premises, the homeowner may be liable in damages for the injuries your child has suffered. If your child has suffered a choking injury from a coin due to another person’s negligent supervision or negligently maintained premises, you may be entitled to damages in compensation. Contact child coin-choking injury lawyer Jeffrey Killino today at 877-875-2927 to obtain expert and experienced assistance.